Our Mobile Decontamination Unit (MDU) can be towed by any vehicle with towing capabilities. The unit requires minimal storage space, is cost efficient, and can be used in different locations as required. 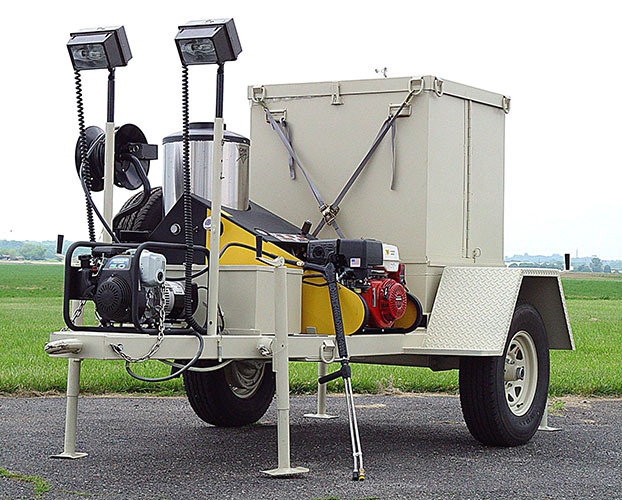 The Mobile Decontamination Unit consists of an Oasis Trailer, hot water pressure washer, two 650-watt rough service lights, 2,700-watt HP generator, and a PN/SKU’S: WFI-0320-SLC water container. The hot water pressure washer uses a gasoline engine with an output charging system. This charging system powers the 12-volt DC burner that uses diesel fuel or kerosene. These models do not require any direct electrical power source, providing extreme portability around any deployed site. The model features a triplex ceramic plunger pump with stainless steel valve, one half inch ID schedule 80 coil, 5-gallon stainless steel fuel tank, 50 ft. hose and reel, variable temperature and thermostat (45 to 185 degrees F above ambient temperature), trigger gun with dual wand, and 5 interchangeable nozzles. The trailer is 142 inches long x 83 inches wide and has a rubber torsion axle rated at 6,000 lbs. The trailer has (6) tie-down rings rated at 5,000 lbs. each for securing the unit. A tool box and (2) 5-gallon fuel cans are permanently mounted to the unit. There are (4) leveling jacks, rated at 5,000 lbs. each, to level the unit on uneven ground. The trailer comes wired with a standard trailer plug and has a full-size spare tire. There is oneWFI-0320-SLC water container which holds 320 gallons. The WFI-0320-SLC container is secured to the trailer using steel locking pins and (4) tie-down straps. These models do not require any direct electrical power source, providing extreme portability around any deployed site.